This novel is the story of a lesbian activist for HIV/AIDS services who runs a non-profit learning that she has MS and turning her activist skills towards attitudes to and services for MS. Mara is angry at the world and feels very alone. She used to care for her heroin-using sister when she was younger, but her sister died. Her mother lives back at their home in London, while Mara lives in Atlanta, Georgia. Her wife has just left her, and her best friend is moving away to a new job. Mara is let go from her own job. She is struggling to deal with the symptoms of her disease, and maybe worse, dealing with the medications she is given. She becomes angry and very politically motivated. She starts to seem paranoid, and there's a question about how much her anger is an overreaction or is counterproductive. But Mara is also used to getting her way, and experiencing herself as powerful. She trained herself to become expert at judo, and she was a confident kayaker. When negotiating with others, she is forceful and innovative. But she is short tempered and isolates herself a lot of the time. She does get a cat though, who keeps her company. 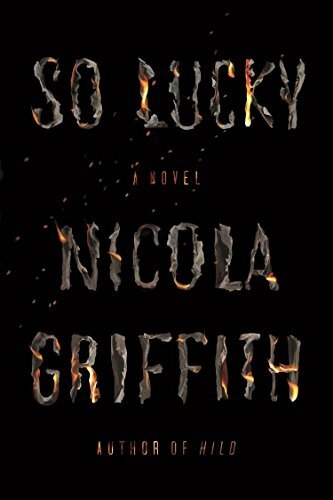 So Lucky clearly has some strong autobiographical elements. Griffiths herself is a lesbian with MS, according to one interview. She writes with great knowledge about the symptoms and treatments, and how other people treat you when you reveal to them that you have MS. Mara's critique of the MS industry sounds like it comes directly from Griffiths: the focus is on very expensive medical treatments, and treatments to reduce the side effects of the primary treatments. It is all very focused on the products of Big Pharma, and the brochures are written by their PR departments. There's no reference to the real needs of people with MS, and none of the material is written by people with MS. It seems likely that Griffiths wants to change that just as much as Mara. Griffiths hosts a Twitter exchange called CripLit and Mara uses the word cripple to reclaim the term from derogatory use. The plot of the novel, which brings in a hate-crime murder of a person with MS, doesn't have enough strength to give the story much of an arc. It's more of a plot device on which to hang a lot of ideas. But the ideas are interesting, and Mara is a compelling narrator. Note that Griffiths herself reads the unabridged audiobook. Like Mara, she is originally from the UK, and she has a completely British accent. At various points she tries to do an American accent, specifically a southern one, and the result is unfortunate. But that's only a small blemish on an overall strong performance.